Chargers for all of our various iDevices are a necessary evil. One is in the kitchen but it’s for the iPad, another is in the bedroom but it’s only for the iPhone. Then there’s a charger in the den but it’s already in use by another family member. Frustrating. Kanex has a product to reduce your frustration level. 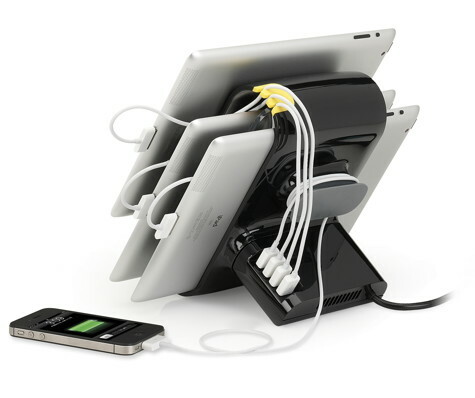 Their oddly-named Sydnee is a robust charger that will handle up to four iDevices simultaneously. 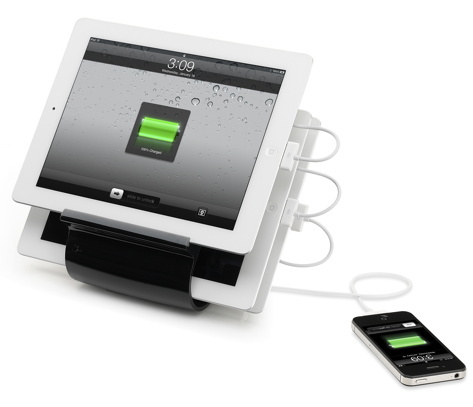 Find a location in your home for this charger and consider it a home base for all of your devices. It provides one place to charge everything—forget about all the individual chargers and instead, use this unit to charge everything. Sydnee is a powerful charger capable of handling iPads and iPhones as its circuitry supplies 2.1 Amps, +5V to each port. It has four USB sockets that come equipped with three short, fifteen inch, Apple certified, 30-pin, USB cables. There is built-in circuit security which includes a fuse and surge protection. Sydnee is available in black or white models and can handle voltages from 110V~230V. The design of Sydnee makes placing iPads a little awkward—they must be inserted from the side of the unit. A drop-in-from-the-top solution would have been more convenient. iPhones can be placed in these cavities or just left on the table next to the device using the short cables provided. Kanex needs to update the cable selection included with the unit by adding a couple of Lightning cables for the newer iDevices. There is a spool on the back of the unit so that your existing Apple cables can be wrapped around it to minimize cable clutter. Sydnee will accommodate iPads in cases provided they are reasonably slim. Large notebook or heavily padded cases need to be placed on the front lip as they won’t fit into the openings on the sides. Kanex says that Sydnee will also charge the new iPad mini as well as Kindles. Those people who like the Place For Everything and Everything In Its Place concept will really appreciate Sydnee. 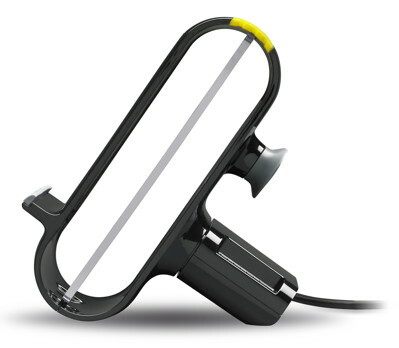 Find a convenient, central spot in your home and everyone will know where their device is parked for charging. Sydnee occupies quite a bit of space when it is loaded with iPads and iPhones. It stands just over nine inches tall and from the top, it measures over ten inches wide by seven inches deep when fully loaded. Sydnee is quite expensive considering what it does. A power strip with four chargers pugged into it will serve the same function but nowhere near as elegantly. Those complaints aside, as a base station for all of your iDevices, Sydnee fills an ever-growing need for charging capacity. MyMac Review rating is 7 out of 10.